Saramollagrass (Ischaemum rugosum) is a monocot weed in the Poaceae family. In Colombia this weed first evolved resistance to Group A/1 herbicides in 2000 and infests Rice. Group A/1 herbicides are known as ACCase inhibitors (Inhibition of acetyl CoA carboxylase (ACCase)). Research has shown that these particular biotypes are resistant to fenoxaprop-P-ethyl and they may be cross-resistant to other Group A/1 herbicides. Greenhouse, and Laboratory trials comparing a known susceptible Saramollagrass biotype with this Saramollagrass biotype have been used to confirm resistance. For further information on the tests conducted please contact the local weed scientists that provided this information. There is no record of differences in fitness or competitiveness of these resistant biotypes when compared to that of normal susceptible biotypes. If you have any information pertaining to the fitness of Group A/1 resistant Saramollagrass from Colombia please update the database. The Herbicide Resistance Action Committee, The Weed Science Society of America, and weed scientists in Colombia have been instrumental in providing you this information. Particular thanks is given to Bernal Valverde for providing detailed information. Ortiz, A. ; Blanco, S. ; Arana, G. ; López, L. ; Torres, S. ; Quintana, Y. ; Pérez, P. ; Zambrano, C. ; Fischer, A.. 2013. Current status in resistance of Ischaemum rugosum Salisb. to herbicide bispiribac-sodio in Venezuela. Bioagro 25 : 79 - 89. 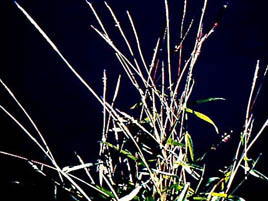 Ischaemum rugosum is reportedly the most difficult to control weed in rice fields of Venezuela. The objective of this study was to evaluate the resistance of I. rugosum to bispyribac-sodium. Three experiments were established: (1) detection bioassay, (2) dose response and (3) control of resistant (R) accessions. In the first experiment, 71 accessions and a susceptible (S) control were treated with 40 g.ha-1 a.i of bispyribac-sodium (recommended rate); fresh weight percent was measured 21 days after application. To quantify the resistance level, a dose response experiment was conducted with the R accessions IR37P, IR44P, IR75G, IR90G, IR82G and IR106G and the S accession IR143G; putatively R plants were treated with 0, 20, 40, 80, 160, 320, 640, 1280 g.ha-1 a.i. of bispyribac-sodium and S plants with 0, 2.5, 5, 10, 20, 40, 80 and 160 g.ha-1 a.i. We found that 26 accessions from the State of Portuguesa, 13 from Guárico and 2 from Cojedes were R to bispyribac-sodium. This test confirmed the resistance to bispyribac-sodium: IR37P; 106G; IR44P and IR82G showed resistance indices (RI=ED50R/ED50S) of 8, 44, 262.81 and 446.75 respectively, while RI values to quantify the high resistance of IR75G and IR90G could not be estimated (ED50R >1280 g. ha-1 a.i.). Cross-resistance was assayed by treating the R accessions with 60, 30, 157, 160, 3360 and 988 g.ha-1 a.i. of pirybenzoxim; nicosulfuron, imazethapyr+imazethapyr; profoxydim, propanil and oxadiazon, respectively. IR75G and IR90G were R to all herbicides used except oxadiazon..
Zambrano, C. ; Araujo, M.. 2009. Evaluation of resistance of Ischaemum rugosum populations to profoxydim herbicide in rice (Oryza sativa). : 485 - 487. In order to evaluate the resistance of Ischaemum rugosum Salibs. populations to the profoxidim herbicide in rice (Oryza sativa L.) from different localities of Portuguesa and Guárico state, I. rugosum seeds were collected by Zambrano and Espinoza (2004). A trial with a completely randomized design was, then, established at the Agronomy Institute shed, Faculty of Agronomy, Central of Venezuela University. Evaluation of fresh weight were carried out 15 days after herbicide application, which doses used were the following: 0x; 1/4x; 1/3x; 1/2x; 3/4x; x; 3/2x; 3x, where the recommended commercial dose is 160 g.i.a/ha as a adjuvant proportion recommended by industry. The resistance index (IR) was obtained by the response doses logistic model of the S.A.S® program. Population that presented an IR>2 were considered resistant. The resistance index found in the biotypes was the following: Potrero de Armo (1,47); Calabozo (1,63); El Jobal (1,13) were susceptible; and El Esfuerzo (365); was considered populations of I. rugosum resistant to profoxidim, respectively..
Rao, A. N. ; Johnson, D. E. ; Sivaprasad, B. ; Ladha, J. K. ; Mortimer, A. M.. 2007. Weed management in direct-seeded rice. Advances in Agronomy 93 : 153 - 255. Rice (Oryza sativa L.) is a principal source of food for more than half of the world population, especially in South and Southeast Asia and Latin America. Elsewhere, it represents a high-value commodity crop. Change in the method of crop establishment from traditional manual transplanting of seedlings to direct-seeding has occurred in many Asian countries in the last two decades in response to rising production costs, especially for labour and water. Direct-seeding of rice (DSR) may involve sowing pregerminated seed onto a puddled soil surface (wet-seeding) or into shallow standing water (water-seeding), or dry seed into a prepared seedbed (dry-seeding). In Europe, Australia, and the United States, direct-seeding is highly mechanized. The risk of crop yield loss due to competition from weeds by all seeding methods is higher than for transplanted rice because of the absence of the size differential between the crop and weeds and the suppressive effect of standing water on weed growth at crop establishment. Of 1800 species reported as weeds of rice, those of the Cyperaceae and Poaceae are predominant. The adoption of direct-seeding has resulted in a change in the relative abundance of weed species in rice crops. In particular, Echinochloa spp., Ischaemum rugosum, Cyperus difformis, and Fimbristylis miliacea are widely adapted to conditions of DSR. Species exhibit variability in germination and establishment response to the water regime postsowing, which is a major factor in interspecifically selecting constituents of the weed flora. The relatively rapid emergence of "weedy" (red) rice, rice phenotypically similar to cultivars but exhibiting undesirable agronomic traits, has been observed in several Asian countries practicing DSR, and this poses a severe threat to the sustainability of the production system. Stale seedbeds, tillage practices for land leveling, choice of competitive rice cultivars, mechanical weeders, herbicides, and associated water management are component technologies essential to the control of weeds in DSR. Herbicides in particular are an important tool of weed management, but hand weeding is either partially or extensively practiced in countries of Asia, Africa, and Latin America. Though yet to be globally commercialized, transgenic rice varieties engineered for herbicide resistance are a potential means of weed control. The release of herbicide-resistant rice for red rice control in the United States has indicated the need to critically examine mitigation methods for the control of gene flow. Integrating preventive and interventional methods of weed control remains essential in managing weed communities in DSR, both to prohibit the evolution of herbicide resistance and to maximize the relative contributions of individual components where herbicides are not widely used. There remains a need to further develop understanding of the mechanisms and dynamics of rice weed competition and of the community dynamics of weed populations in DSR to underpin sustainable weed management practices..
Zambrano, C. ; Hernán, E.. 2005. Evaluation of resistance in Ischaemum rugosum Salisb. populations in rice fields in Portuguesa and Guárico to bispyribac sodium. Anales de Botánica Agrícola 12 : 5 - 12. Resistance to bispyribac sodium [bispyribac] was evaluated in I. rugosum populations from rice fields in Portuguesa and Guárico, Venezuela, where the herbicide had been applied for 6 years and weed control problems are experienced. Seeds collected from the fields were sown, and resulting plants were treated with bispyribac at 0, 10, 20, 40 (recommended rate), 80 or 160 g a.i./ha. Resistance index (RI) and resistance curves were determined using a logistic model and the Sigma Plot 7 program, respectively. Populations that registered IR values of >2 were considered resistant. Biotypes resistant to bispyribac sodium were recorded..
Zambrano, C. L. ; Espinoza, H. ; Mejía, L.. 2005. Evaluation of resistance to bispiribac-sodium of Ischaemum rugosum Salisb. biotypes from rice fields of Portuguesa and Guárico state. : 339 - 345. In order to evaluate the resistance of Ischaemum rugosum Salisb. populations to the byspiribac-sodium herbicide in rice (Oryza sativa L.) from different localities of Portuguesa and Guarico state, I. rugosum seeds were collected in the field, with reports of control problems, where farmers had at least a six-year record of this herbicide application. A trial with a completely randomized design was then established at the Agronomy Institute shed, Faculty of Agronomy, Central University of Venezuela. Evaluation of height and fresh weight were carried out 15 days after herbicide application. Dosages used were the following: 0; 10; 20; 40; 80; 120 g. a.i./ha, where the recommended commercial dose is 40 g.a.i./ha. The resistance index (RI) was obtained by the response dosage logistic model of the S.A.S. Program, and the resistance curves by the Sigma Plot 7 Program. Population that presented a RI>2 were considered resistant. The resistance indexes found in the biotypes were the following: L6 1,02 (susceptible) and AG001 4,13; AG002 4; were considered populations of I. rugosum Salisb. resistant to bispyribac-sodium, respectively..